1. Museums: I don't know how long it would take you to visit all the museums in Florence -- a year, probably, if you include all the palazzos. We had tickets to the Accademia for 1:30, so we walked up there, had lunch nearby, and presented ourselves with the voucher for the tickets. That let us right in without standing in line for one minute. We spent a while looking at the pictures, then went into the area where the David is, and stayed there for quite a while. It's hard to describe the feeling of being in his presence -- even with a bazillion people milling around, it's still a very moving experience. It's much bigger than you think (or I thought, anyway) -- I don't know how many times the size of a man. That museum is small but very nice and doable in an hour or two. 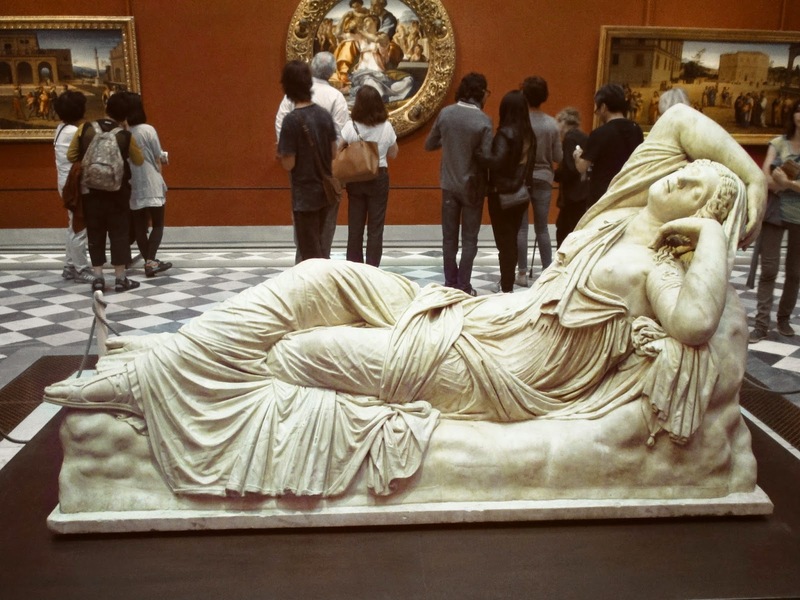 It has a wonderful sculpture room, with not real sculptures but plaster casts, which are also very beautiful. 2. Then we took a taxi to the Uffizi (getting a grand tour of the city from the taxi driver), and here's where I want to say something about Italian people. 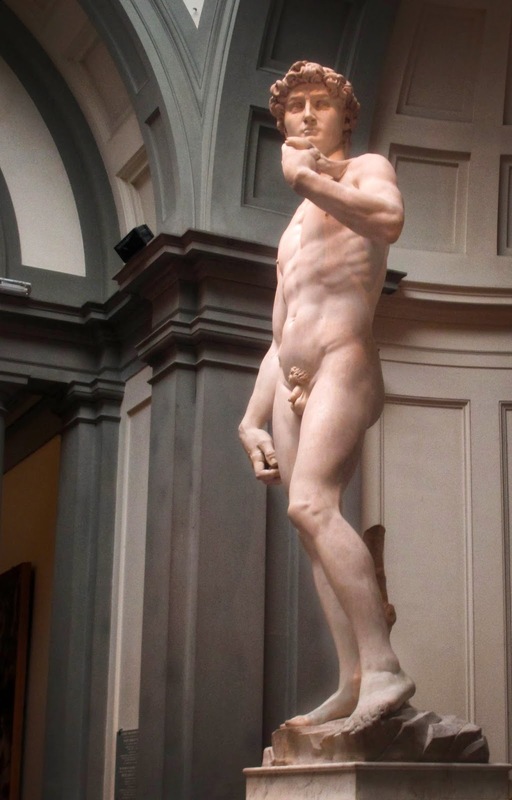 Before we got to the Uffizi, I realized that we had a big problem -- I had had two sets of vouchers, one for each museum, and the people at the Accademia had taken the voucher for the Uffizi, so we didn't have the right voucher to get our tickets. I fretted about this until we got to the ticket window, thinking that we'd have to either 1) spend another 30 euros for a second set of tickets, or 2) give up and lose the 30 we'd already spent. The lady at the ticket window looked stern, but I explained the situation, and not only did she give us tickets, but another woman walked us over to the entrance to explain the unusual situation, and we got right in. This has happened a number of times, like the couple who walked us to the restaurant in Ferrara. If you are polite, they can be so kind and helpful. If you're not -- well, there was the young man in front of us in a train ticket line who was arguing with the lady, eliciting not only a "mama mia," but also a "how can you be so stupid!" I was very, very polite to that lady, for sure! 3. 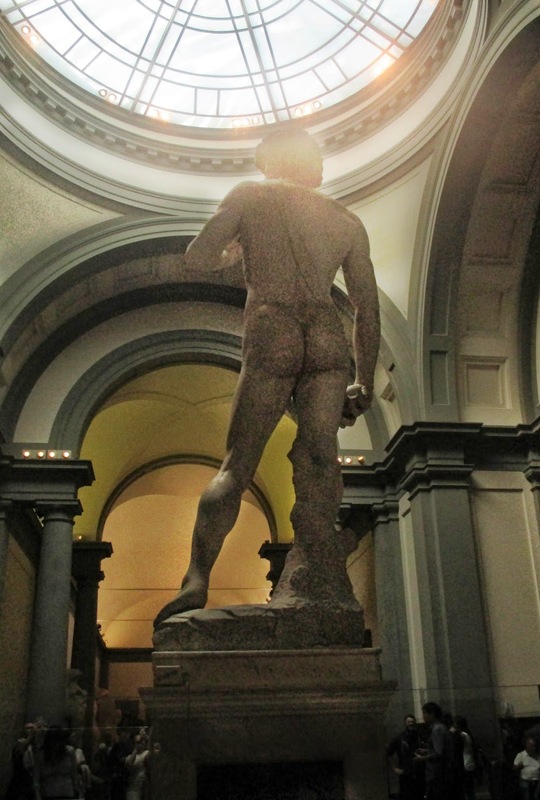 The Uffizi: okay, we have to admit it -- we kind of wimped out on the Uffizi. We saw the Boticellis and the Leonardos and the Bellinis and some other things, but after making the circuit of the top floor, I said I just couldn't do any more -- it was incredibly hot, I had sweat running into my eyes and mouth, it was just too huge and exhausting, and sitting on a bench in the hallway after every room was not really doing the trick. Ed was also worn out before we began -- we'd been in line for the (tiny -- they're all tiny) elevator, and he got tired of waiting and said he'd take the stairs. Well, they make you start at the top and work your way down, so he had to go up five flights of stairs to get to where I got off the elevator. We were not happy campers at the Uffizi, I'm afraid, but we did love the pictures we saw. A beautiful sculpture, but I don't know of what or by whom. 4. Trains again: After our last night in Firenze, we parted ways this morning -- Ed homeward bound, with a layover in Paris overnight, and me on the train to Lucca. I had another interesting train experience -- I got to the station about 11:30, intending to take the 12:38 local train to Lucca. There was a crowd milling around near the ticket booths, but no one in line for them. I finally asked someone who spoke English what was going on, and he said you had to take a number and wait for them to get to your number before you could buy your ticket. So I got ticket #490, and checked on where they were -- #440. I waited a few minutes, and after they had made very little progress, I went to another counter where for 2 extra euros you could get a ticket immediately. Well worth it, because by the time I got up to go to the train, they were almost to my number . . . Then something strange happened on the train. We were sitting there waiting, had a few minutes until departure, when there was an announcement (in Italian -- nothing related to trains is in English) and suddenly everyone started getting off the train! I was very perplexed about this, but just as I was thinking I should get off too and getting my stuff together, people started getting back on again. I found someone who spoke English, and she said they were announcing a 10 minute delay before we left. Whew. I got to Lucca just fine, and Alessio (the husband at the B&B) was there to pick me up. So I am tired but happy in my B&B. When we were in Ferrara, the wife of a very nice couple we met said something about weren't the mosquitoes in Venice just awful? I hadn't noticed any mosquitoes; as a matter of fact, we were commenting on how few bugs there were. Ever since she said that, I have been accumulating one bite after another, until now I am covered with them. It's all her fault. More tomorrow.